Although dresses will always be my first love, I am stepping a little out of my comfort zone just lately and have recently made my first pair of culottes. Driven by all the great images of culottes that I have seen over the past few months I have finally given it a go, and couldn’t be happier with them. They are my latest make for the Minerva Crafts Blogger Network, and I have used the incredibly popular Butterick B6178 pattern for this project. 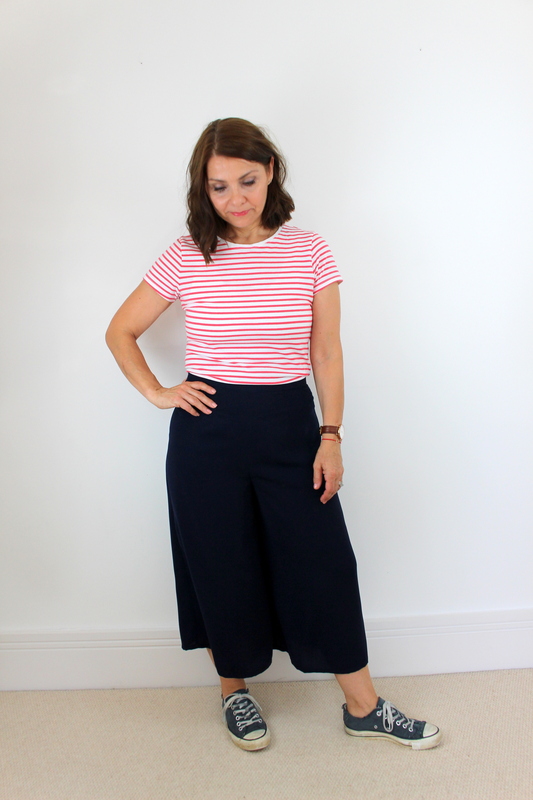 I chose to use a super soft crepe for the culottes, at the bargain price of £4.99 per metre and they are so comfortable and soft, my only regret is not making them sooner. Do head on over to the Blogger Network linked above for my full review, and I’ll see you over there! My latest Sewisfaction Blogger Team post – The Fringe Dress from Chalk & Notch. Although I won’t go into too much detail here, I would like to mention the pretty fabric which was kindly sent to me -what a fabulous colour and so perfect for Summer! It is the first time that I have sewn anything by Chalk and Notch, and I really enjoyed making this dress. If you are familiar with this pattern you may notice that I chose to change the hemline to a regular horizontal hem rather than keep it as a shaped hem. This year my #2018makenine pledge is to try to sew nine items using patterns from independent pattern companies that I have not used before, and this is my fourth make for this challenge. Thank you for stopping by, and I’ll see you over at Sewisfaction! The beginning of the month means that it is time to share with you the link to my latest Minerva Crafts Blogger Network make. This month it is this McCalls M7406 wrap dress. This is the first time that I have made a wrap dress, what took me so long? Its pretty, feminine and flattering, and I love the long belt and flutter sleeves on this dress. The pretty floral crepe is set against a black background and this fabric is currently on sale at £6.99 per metre. Also, again at the time of writing this, the McCalls pattern is half price too – at £4.62! I’m not sure how long either of these items will stay at that price! I’ll let you head on over to the Minerva Crafts Blogger Network to read the full review, if you would like more details. 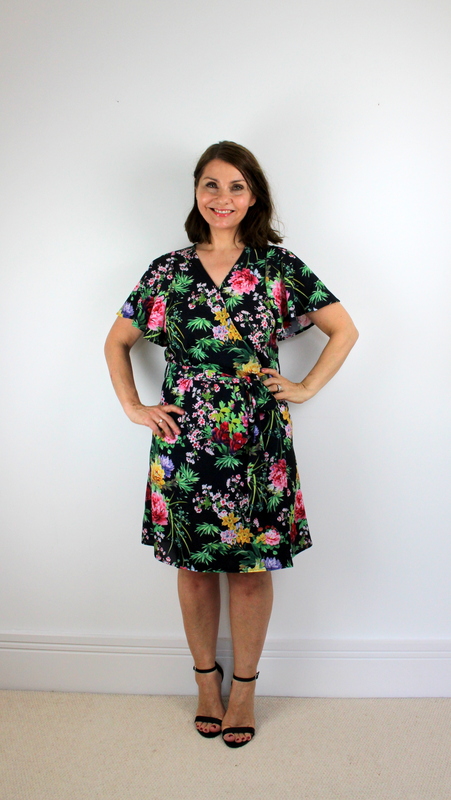 I am also going to offer this as my #sewtogetherforsummer entry, which is a friendly sewing challenge to make a wrap dress, hosted by Sarah, Monika and Suzy. So do visit these lovely ladies over on Instagram for all the details! 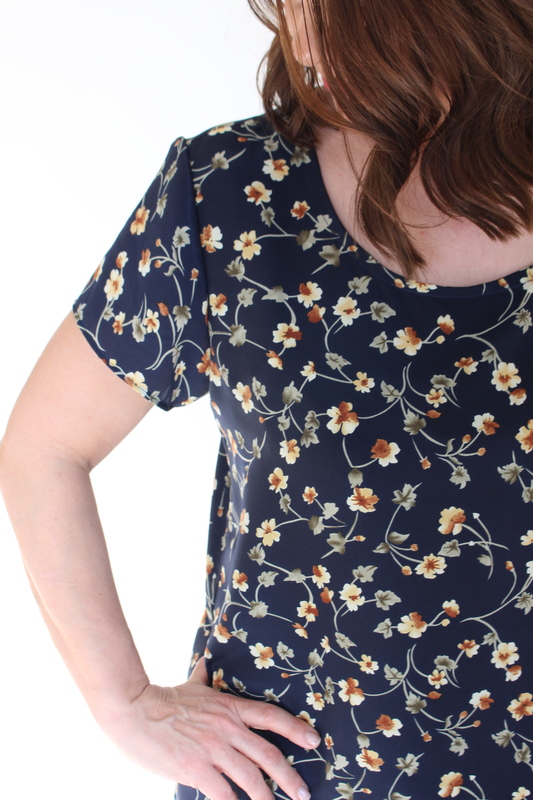 My #alittlelawnparty entry – a Simplicity 2586 pattern review. You know me – I love a good Instagram sewing challenge. This challenge has been organised by Mel from Handmade by Ditsy-Tulip and Atia from The Bright Blooms . If you follow me on Instagram you might have noticed that, as an ambassador for this challenge, I have mentioned it a few times on my stories. But if you need more details then do head on over to Mel and Atia’s website where it is all explained. To summarise, it is a friendly sewing challenge to celebrate the arrival of Spring. In a nutshell the idea is to have a bit of fun sewing a Spring themed garment and share your make on Instagram using the hashtag #alittlelawnparty . I think originally the idea was to make a garment using cotton lawn, but as this is not always easy to get hold of at a reasonable price in certain parts, so you may use any fabric of your choice as long as you are using it to make an outfit that is ‘Spring-like’. At first I thought deciding what to make would be really easy. For someone who absolutely loves floral fabrics and has a ton of dress patterns this should have been a breeze for me, but whilst I knew the fabric that I wanted to use, I struggled deciding which sewing pattern to pair with it. I also think that because the challenge runs over a two month period, I sat back a little and kind of left things a little later that I should have! Not to worry though, if you are still working on your project the closing date is not until the 15th of May 2018 so there is still plenty of time to get your entry in! After posting a picture of what I thought was the perfect pattern for this challenge on my Instagram account, I swiftly changed my mind after I received several messages to say that the particular pattern that I was planning to use required a great deal of adjustments and changes. By this stage, I really hadn’t got the time to spend on a dress which required so much work and alterations, so the happy outcome was that I chose another pattern that I have had in my stash for absolutely ages- Simplicity 2586. I don’t know very much about this pattern, except that it does not seem to be available in the U.K. It is possibly an old out of stock pattern? – correct me if I’m wrong – and I think I bought mine from an Etsy seller a long time after ago (as they do seem to be available in the U.S) but watch our for hefty postal charges as most of these patterns seem to be from U.S sellers. 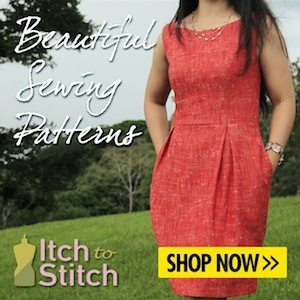 I am crazy about the blue belted version of the dress as shown on the front of the pattern envelope, and thought that this could make a pretty Spring dress. I had bought this adorable crepe from Sew Me Sunshine fairly recently and decided that this combination was the dress I wanted! It’s a blush pink crepe with the classic crinkled texture and is scattered with light blue flowers. So so beautiful. I have linked the fabric for you and at the time of writing this it is still in stock at £3.50 per half metre. The dress has turned out really well, although the next time I make it I will make a couple of little changes. 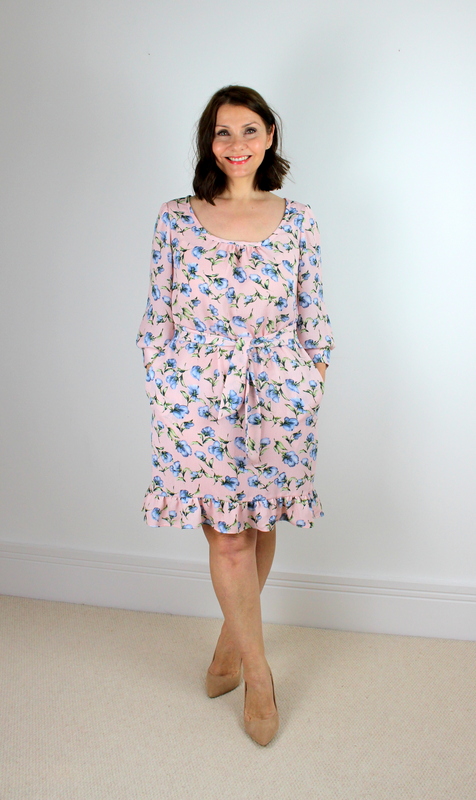 Whilst I LOVE the crepe and chose it as I wanted a really drapey fabric, it is quite slippery to work with (as you would expect with crepe) and in certain areas like the narrow neckband it was a little fiddly. I may have said some naughty words whilst sewing this part. On the subject of the neckline, I felt this came out quite low and wide. Still very wearable but I think I will adjust it a little next time. Finally the sleeves. They are slightly wide, but I can live with that. The sleeve cuffs though – they are massive! I would definitely need to make these much smaller for future makes as they are huge! This will teach me for not making a toile up. ( I always make toiles of patterns that I haven’t made before – I can’t imagine why I didn’t this time)! Tut Tut! That being said, the dress is beautiful I think, and it is super cute. It has pockets for a start. Gotta love them. I also really like the ruffles around the bottom of the hem and the fabric belt, and with some small adjustments this could very well end up being a favourite pattern of mine. Easy to slip on and off over the head, I like that there are no zips, buttons or elastic on this dress. Nice and straightforward as far as construction is concerned. I do love Simplicity patterns. A huge thank you to Mel and Atia for organising such a fun challenge. Do head on over to their websites linked earlier on in this post for all the details. There are some great prizes to be won at the end of the challenge too, which is always a bonus! We are very lucky in the sewing community to have such generous businesses that always provide such wonderful gifts for these sewing challenges. More Spring inspiration can be found by searching the hashtag #alittlelawnparty over on Instagram. I for one am ready and waiting for warmer weather to arrive so that I can actually wear my dress! My Butterick B6380 ‘patterns by Gertie’ Tea Dress pattern review and photo shoot with Love Sewing Magazine. Ok, today’s blog post is a little different. I’m going to give you my pattern review of Butterick B6380, which is the free pattern in this month’s Love Sewing magazine. This time however, I am also sharing with you my pics from the photo shoot that I had with Love Sewing, as I was thrilled to be asked to write a review on the pattern as a feature in the magazine. Somebody pinch me. So although I have made many Butterick patterns before, this is the first time that I have made a ‘patterns by Gertie’ design and I was super excited to try it. I love the vintage style of the dress and have admired many of Gertie’s makes that I have seen made up by other sewists. The great thing about the pattern that you receive in Love Sewing magazine is that it covers the whole size range (6-22) in one pattern. You can see that it is a vintage inspired tea dress with a close fitted bodice, and a shaped panel at the waistline with gathers above front and back. It has a sweetheart neckline which is cleverly formed by two small tabs, and has more delicate gathers at the shoulders. It fastens with a zip down the centre back seam. I had so much fun selecting the fabric for this dress. I wanted a floral fabric ( you know me – no surprises there)! 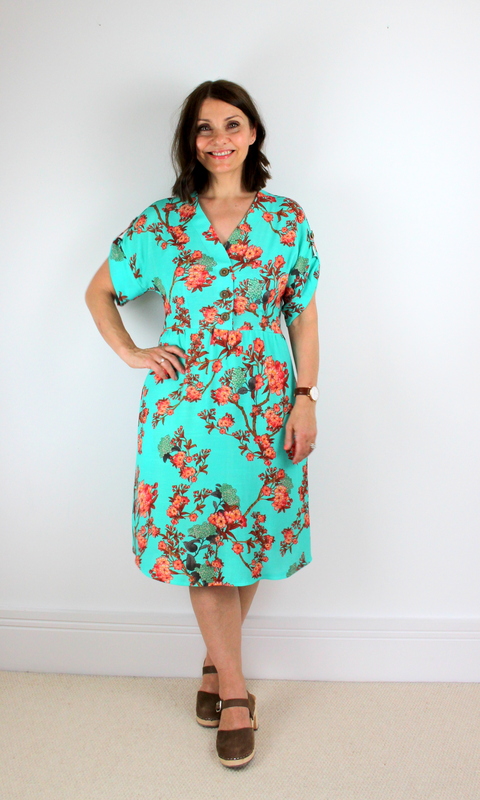 but didn’t want a full-on vintage design, so chose this wonderful crepe from Fabric Godmother. It has grey flowers on a sage green background and as soon as I saw it I fell in love. I’m hoping it gives the dress design a modern twist, I think it works really well. The fabric has a beautiful drape and was very well behaved and easy to sew with! After making a toile, I realised that I wanted to make some adjustments. In terms of sizing, I found that I needed to make the bodice in a size 12 and grade out to a size 14 at the waist. This was very simple to do. I also wanted to take out some of the volume in the puff sleeves – they had a little too much height for me so I gently shaped the sleeve head to make a softer curve. Again this was nice and simple and now the sleeve head shape and gathers are just how I like them! I also decided to pop in an invisible zip. The pattern calls for a lapped regular zip, but my preference is for an invisible fastening and this was no problem to swap over to. Finally I felt that the neckline was a little too low for me. So simply raised it by extending the seam at the centre front by 3cm. I took the opportunity to use this extra seam length to add three little self covered buttons as a decorative nod to the vintage style of the dress. The dress is fully lined by the way, and this involves basically sewing another dress using lining fabric. If this is something that you haven’t done before – don’t be put off, as the Butterick instructions are extremely simple to follow. It’s not a quick dress to make, but your time and patience will be rewarded. The style of this dress is so feminine and the fact that it is fully lined makes it feel super special to wear. I’m going to take this opportunity now to share with you my day at the Love Sewing photo shoot. Quite simply I was spoilt rotten, pampered and fussed over from start to finish! I took the train up to the studios in Stockport and was warmly welcomed by Amy, the editor of Love Sewing magazine. I had met Amy briefly a couple of times before, and knew that I would enjoy spending the day chatting with her and getting to know her better. She is perfectly adorable, and could not have made me feel more relaxed. This is the first time I have ever had my make-up applied by a professional make-up artist and it was fabulous! Quite frankly I could have taken Nina home with me. To top it all she styled my hair, and basically pampered me throughout. What a sweetie. Accessories and shoes were all lined up to choose from, talk about ‘kid in a sweet shop’! The stunning photographs were taken by Renata. Her studio set is wonderful, and I could have squealed when I saw the famous Love Sewing white panelled back drop. Renata quickly relaxed me and took me through lots of suggestions to get a great variety of shots. I must admit I had felt quite anxious about this, as having my photo taken is the thing that I enjoy the very least about this whole sewing malarkey. However, it was so much fun and the whole team worked together to produce these fantastic photos and a day that I will treasure. Although I could witter on about this experience all day, I will end with my personal highlight. The page 3 shot with Amy. As a regular reader of Love Sewing, I enjoy the personal feel that Amy gives the magazine and always enjoy seeing the picture of the reader reviewer with Amy on page 3. Total fan-girl moment. I could cry. I cannot thank everybody mentioned here for making this whole experience so special. It was unforgettable.